I never did get the chance to see the theatrical production of Les Misérables; such are the vagaries of the calendar. Fortunately, there is this magnificent film from the director of the superlative crowd-pleaser, The King’s Speech. The leap from stage to screen is entirely sensible for the sort of big-spectacle theatre. What cinema lacks in the energy of a live performance, it makes up for in a kinetic energy all its own as well as a natural affinity for grandeur. 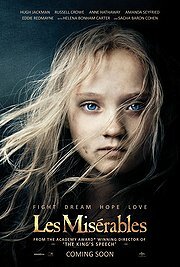 What an epic story Les Misérables is, the human condition writ upon a canvas with bold strokes of revolution, hope and love amidst humanity’s cruel capacity for inhumanity.